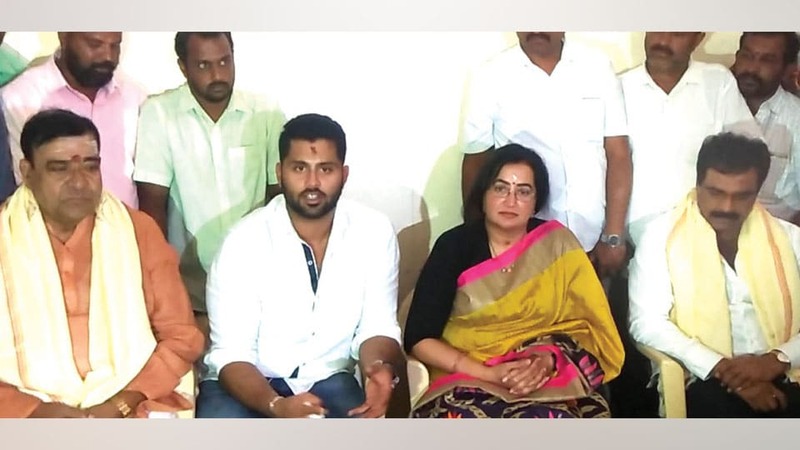 Mandya: Actress Sumalatha, wife of late actor-turned politician Ambarish, visited the Adichunchanagiri Mutt at Bellur in Mandya district yesterday and sought the blessings of the Mutt Seer Sri Nirmalanandanatha Swamiji. Speaking to press persons later, Sumalatha said that her family is having a good bonding with keen on her contesting in the ensuing LS polls. Showing an inclination to contest on a Congress ticket, she affirmed that she would contest only if opportunity arises and after discussions with Ambarish’s fans and political leaders. Sumalatha refused to comment on the controversial remarks allegedly made by JD(S) MLC K.T. Sreekantegowda on her origin which had sparked protests in Mandya recently. Sumalatha clarified that her visit to the Mutt was to seek blessings of the Seer for her son Abhishek’s movie to be released shortly. Abhishek recalled that Feb.14 was the favourite day of Ambarish and hence, the teaser of his first film ‘Amar’ would be released that day online on a simple note sans any fanfare. He added that he would be away for shooting abroad that day. Actor Doddanna and Producer Rockline Venkatesh were present.